Four Caribbean destinations currently have Citizenship By Investment Programs – Antigua & Barbuda, Dominica, Grenada and St Kitts & Nevis. Based on the success of these programs and the continued need for Foreign Direct Investment, others in the region have looked at launching their own Citizenship By Investment Program. The known list includes Bermuda, Barbados, Jamaica, Montserrat, and St Lucia who recently commissioned a report on the feasibility of implementing a program of their own. Montserrat – Aerial view of proposed Master Plan development for new town including Little Bay & Carr’s Bay. Photo: © Montserrat Development Corporation. Why did Montserrat want to launch a Citizenship By Investment Program? Well, Montserrat known as the Emerald Isle of the Caribbean is desperate for funds to build a new port and town to replace the former capital Plymouth that was buried under volcanic ash and mud due to the Soufrière Hills Volcano eruption some twenty years ago. 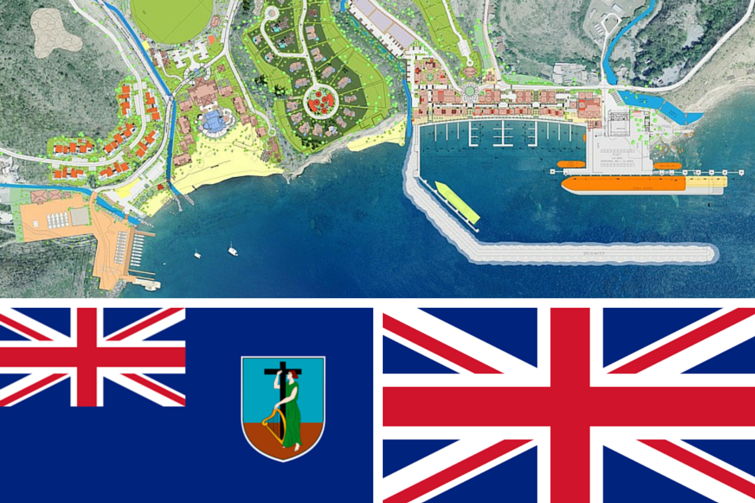 The island a British Overseas Territory is now mostly funded by the UK Department for International Development (DFID) and the monies received annually only cover recurrent expenses for the island. Further Foreign Direct Investment from international tourism developers and operators is needed to get the island back to self-sufficiency. Based on the business case put forward by Montserrat Development Corporation in late 2013 at the Heads of Overseas Territories meeting in London, the US$62.5 million would have come mainly from two groups. The first group was from Dubai and was prepared to pay US$2 million per passport. The second, a Chinese group was prepared to pay US$250,000 per passport. 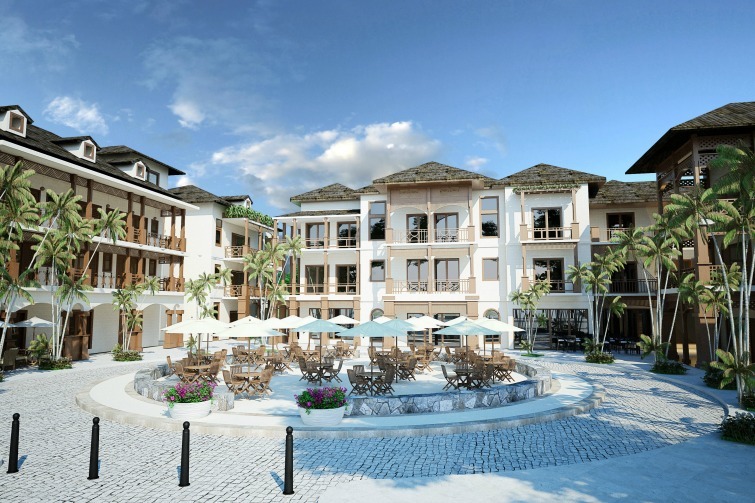 In total, the Montserrat Development Corporation estimated that 75 passports were required for the hotel and Villas projects and 200 for the Town Centre. Montserrat – CGI image of proposed new town square. Photo: © Montserrat Development Corporation. Had the Montserrat Citizenship By Investment Program been approved, the investment level required could have been close to if not above the US$2million level as a British passport which Montserratians travel with has visa-free travel to 174 countries and territories is more valuable than those offered by the existing Caribbean programs. In fact, according to Henley & Partners Visa Restrictions Index, the British passport is ranked number one along with the American, Finnish, German and Swedish passports. So why didn’t the British government who have an investment program of their own not approve the Montserrat one even though it would have been set up with the British conducting the due diligence on prospective applicants and only granting passports to those that they passed? 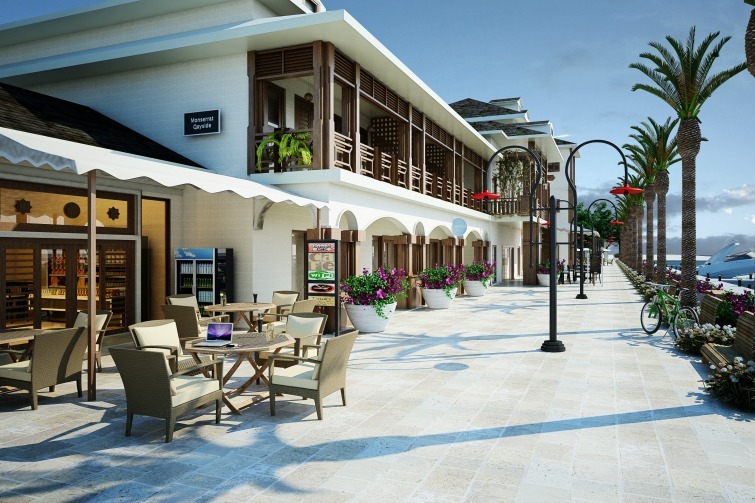 Montserrat – CGI image of street in proposed new town. Photo: © Montserrat Development Corporation. Well, no written ruling was given, but the British program that requires an investment of at least £2,000,000 (approximately US$3.1 million) is for residency with a path to citizenship, not immediate citizenship as proposed by the Montserrat program. Also, there is speculation that had the British approved the Montserrat program; they would also have to do so for the other British Overseas Territories. However, the argument could be made that none of the other British Overseas Territories have spent the last twenty years trying to rebuild their population or economy after being decimated by a volcanic eruption; and so special consideration should have been given for the program — if only for a 5 to 10 year period. Especially since numerous reports by various economists hired by DFID have all come to the same conclusion that the Carr’s Bay port as part of the Little Bay & Carr’s Bay Master Plan was the most viable option to get Montserrat back to self-sufficiency. The port requires an investment of between US$96 million to US$117 million that the British government so far has not been prepared to fund. 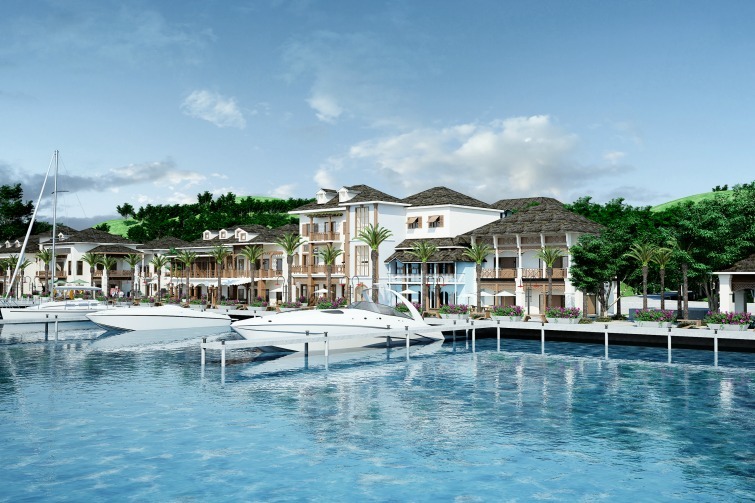 Montserrat – CGI image of waterfront in proposed new town. Photo: © Montserrat Development Corporation. So what is Montserrat to do? With a tiny population of just 5,000 and a stagnant economy, it has no major products to export and raise the necessary capital. Thus, tapping into the economic citizenship market currently worth US$2 billion annually would have gone a long way to jump-start the implementation of the Little Bay & Carr’s Bay Master Plan and really the redevelopment of the whole island. But alas it is not to be. Montserrat could try and modify its current economic residency program, but without granting full citizenship immediately or within a year or two of approval, the program will remain unattractive to the super-rich who are seeking second passports. These ultra high net worth individuals from emerging countries that want to move around the globe with greater ease, will not wait 5 to 8 years for residency and eventual citizenship. Montserrat’s program needs to be competitive not just with those in the Caribbean, but also those in Europe including the newly launched Malta Individual Investor Program, which all grant citizenship immediately after approval. Top photo: Montserrat – CGI image of proposed Carr’s Bay Port development. Photo: © Montserrat Development Corporation.